To that end I will apologize to anyone who by error of ignorance or simple inattention has concluded that I am on a trek of paradisical scope. Oh, there are moments, don’t get me wrong. The weather is spectacular. Million dollar sunrises and sunsets color my world on a daily basis. No commutes, no bosses, no car payments—it’s tough to garner sympathy in my world. But the challenges that confront the human animal exist here as they do in any walk of life, and I am here to tell you that while you thought I was choosing between which tropical cocktail to order and which powdery-white beach to visit, I was in fact slaying the dragons of my life. I had two main objectives in Nassau: (1) to clear customs and immigration, and (2) to get a Bahamas SIM card for my iPhone so that I could be in touch with friends and family without needing to seek out wifi—and while a .500 average would earn me billions in the major leagues it tasted bitterly of defeat here in the Bahamas. I stood hour after hour in the local BaTelCo office, using their crackly landline to run the gauntlet of AT&T customer service. It seems my unlocked iPhone wasn’t in fact unlocked but AT&T couldn’t seem to figure out what to do about that. I was promised an email with an unlock code and instructions, for which I waited three days, rowing back to shore in my dinghy, scaling the scaffolding-like dinghy dock to buy a ginger beer I didn’t really want so I could sit in the gas station and use the wifi to check my email. Finally it arrived. Your phone is not locked, it informed me. Simply install the new SIM card and repower the phone, following the activation instructions. So I returned to the BaTelCo office, where we switched SIM cards and repowered my phone only to get the same error message as before. Borrow their landline again. Call AT&T again. Everyone thinks I’m sipping ice cold beer on a sandy beach when in reality I am trying to stay calm on the phone with a man whose fault my problems are not. I actually uttered the following sentence to this man: I should be sailing, but instead I am locked in some perverse AT&T prison from which no one seems to want to free me. I’m still not sure if that was a high point or a low point, but I got quite the look of approval from the BaTelCo rep for my choice of words. Odd, their definition of rush. The next day the email arrived. Your phone is not locked, it informed me. Simply install the new SIM card and repower the phone, following the activation instructions. At wit’s end, I left Nassau to head to the Exumas, away from high-rise buildings and cellphone stores and water taxis, leaving friends and family with a phone number they think will work but won’t, a tinge of guilt in my soul but not enough to make me stay. My $50 was clearly down the drain. Cést la vie. Ave and I motorsailed from Nassau to Highborne Cay, my planned first stop in the Exumas, less a destination than a rest stop along the path to little uninhabited islands where perhaps I can spend a day doing what it is you think I do all day. As I rounded out of my bearing and in towards my anchorage I happened to glance down at the tiller, where I noticed two small but very dangerous fissures in the stainless cuff that attaches the tiller to the rudder shaft. This was a time bomb of the highest caliber, something that won’t break under light load but will wait until I am fighting big seas where it will split like kindling and I’ll become a sailing statistic. No thank you. There are no welders in Highborne Cay, just big mega yachts with tenders that cost many times what my actual boat cost me, flitting about like bees alighting on a flower and buzzing off again. George Town would have welders but, although it was on my course it was days away and seemed a bad decision; this was something that demanded immediate care, and that meant turning back to Nassau to find a welder. I resolved to depart the next morning, immediately after changing my engine oil. All this motorsailing had pushed my engine hours up, and we do not tempt fate with critical systems; engine oil is changed every 100 engine hours, slightly less if feasible, and is never put off. Luckily it is a routine undertaking, one I had performed many times, and I carry plenty of oil and filters with me. After a rather uncomfortable night where the flitting speedboats, mega-yacht tenders, and sportfish boats repeated buzzed past me, tossing me to and fro in their wakes, I awoke, had coffee and breakfast, and got to work on the oil change. Run the engine. Drain the oil. Add a quarter sump. Crank the engine a few times to distribute it. Drain again. Change the filter. Add 5.4 quarts of new Rotela T 15w-40. Run the engine. Check everything. Bam. But today, with my spirits already somewhat on the ropes, the new oil filter didn’t seat properly and my 5.4 quarts of Rotela T poured out of the block and into the bilge. Note to self: those red oil filters seem not to be compatible with your Universal M35b after all. Toss the rest of them out. Stuck in an anchorage I hated, dodging the very essence of excess that I am eager to get away from, failing miserably at work that I don’t want to do anyway so that I can return to another anchorage I don’t really want to be in so I can spend money I don’t really have didn’t really add up to that Mai-Tai-in-paradise feeling. To boot I had a bilge full of motor oil, daylight was wasting away, and the tide was ebbing. I settled in, focused but decidedly not chipper. I suctioned what I could out of the bilge, soaked the rest up with my year’s supply of oil absorbent pads (add those to the “to buy” list (again)), all the while knowing that the process was cumbersome and wasteful and that the time spent on it would render both a return sail and a re-anchoring in the falling tide untenable. So the prize that awaited me at the end of my work was another miserable night getting knocked around like Sancho Panza getting blanket tossed outside the inn. At this precise moment in time the line between “cruising” and “hazing” seemed blurred at best. The next morning, unrested and edgy, I weighed anchor to again motorsail into the winds and return to Nassau. The violent bucking of the boat over the past day or two had sheered the clevis pin out of the block that holds my snub line off of the chain bobstay, an easy fix but another issue to deal with. I pulled the now-dangling snub line aboard only to watch the bronze hook that holds the block in place tumble into the waters of my anchorage. I was ready to leave. The engine, fat and happy from its two oil changes, was warming up, the cockpit staged and ready. I stared over the bow, wondering how much I cared about this bronze hook. Winds were supposed to pick up in the afternoon—was the “responsible” thing to do diving to retrieve it? Or kissing it goodbye, declaring it a tax paid to the “‘No!’ Day” gods so I could get on my way and sail with a cracked tiller cuff into building winds? Every option sucked. Chances are that at that moment I would have sold you the boat and everything in it for a simple coach ticket out of paradise, had you offered. These are the moments when you remember that your baggage is there with you. You remember that struggle and challenge are a part of the human narrative. You’ve bought a ticket to a ride with higher highs but deeper lows, afloat but adrift in Walden Pond, you know and appreciate that it is real but you maybe-not-so-secretly wish that you still had someone’s shoulder to cry on or that maybe right now you were drinking a Mai Tai even though you don’t really like them. And you trudge. You push forward, knowing that meeting real challenges pays real dividends that are elusive to those who simply tread the treadmill through life. This is the “real” that you sought. So I killed the engine, shut systems down, fetched my mask, snorkel, and fins, and dove to look for the bronze hook. It seemed the right thing to do. There were some huge fish—are those barracudas? ?— down there that I was convinced would want me for breakfast when I dove to their depths, but if that was to be my end so be it; I would die fighting for the last bronze hook that I owned, fighting for a toe-hold of control in my life that seemed desperately short of control at the moment. Fighting to win just one little battle. The hook revealed itself in about 16 feet of crystal clear water not far off of Ave’s bow. I stared off the man-eating fish, filled my lungs with air, and dove like a merman, fins fluttering above me as I sank like a stone to the depths. I grabbed the hook without ado, never did have to punch the fish in the face in a glorious moment of self defense, turned upwards again where the surface appeared to be about 100 yards above me, composed myself and fluttered again, upwards this time, breaking the surface with the hook in my hand and a sizable grin on my face. Maybe, just maybe, my trudging was paying off. I was nearing the mythical, emotional, metaphorical “other shore,” surviving the sharpest stones that cut at my feet and the roaring rapids that had threatened to wash me away as I steadily placed foot in front of foot, unsteady, unsure. That bronze hook was my ticket, my proof that I could ride the ride. I tucked it into my trinkets box, toweled off, and restarted Ave’s engine for the trip back to Nassau. The engine ran, the oil stayed where it should, and Nassau slowly crept into view through the course of the otherwise uneventful day. I suppose that paradise could be a lot worse than this. I did not vomit from nerves, as I thought I might, nor did I hit any coral heads or boats—but I was smacked in the face by a flying winch drum. So all in all this must have been a success. Just a few selections from Ave’s library. I was reading the amazing blog of Howard Rice and the Voyage of Southern Cross when I came across his list of books on board (I’ll be sure to include a link to his blog at the end of this post). Reading is a vital part of my happiness—and sometimes part of my efforts to regain happiness when it is elusive. I have Kindle readers on my iPads but do not yet actually own any e-books; despite my love of the tactile relationship between man and book I’ll be more than happy to download some digital media if that is what is available. Meanwhile, I’ve compiled my own list of reading materials that are currently aboard Ave del Mar, starting with the books that I have read but continually turn to in moments of need. I thought it might be fun to share. 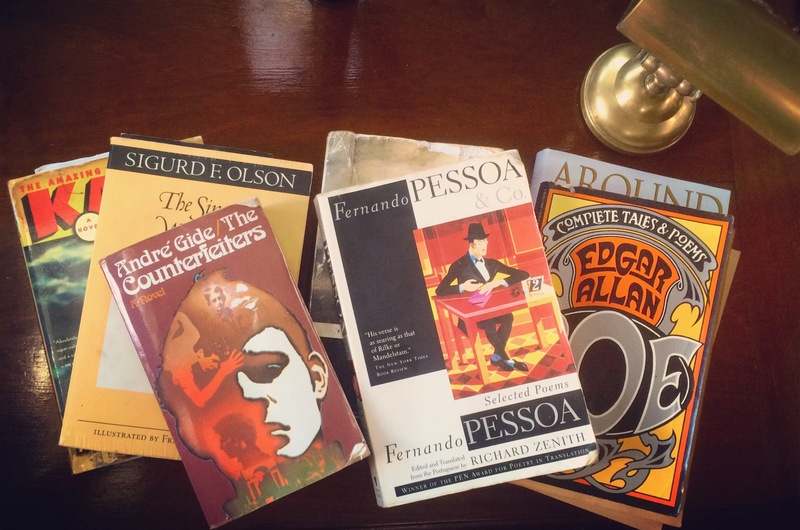 “Fernando Pessoa & Co.,” Fernando Pessoa, the Richard Zenith translations. “Why I Am Not a Christian,” Bertrand Russell. “Complete Tales & Poems,” Edgar Allan Poe. “Love Is a Dog From Hell,” Charles Bukowski. “Living Dharma, Teachings and Meditation Instructions From Twelve Theravada Masters,” compiled by Jack Kornfield. “What Makes You Not A Buddhist,” Dzongsar Jamyang Khyentse. “A Land So Strange, The Epic Tale of Cabeza de Vaca,” Andrés Reséndez. “The Importance of Being Earnest and Four Other Plays,” Oscar Wilde. “The Brief and Frightening Reign of Phil,” George Saunders. “The Memoirs of Sherlock Holmes,” Sir Arthur Conan Doyle. “The Book Thief,” Markus Zusak. “The Life and Times of Horatio Hornblower,” C. Northcote Parkinson. “The Amazing Adventures of Kavalier and Clay,” Michael Chabon. “Guns, Germs, and Steel, the Fates of Human Societies,” Jared Diamond. “Atlantic High,” William F. Buckley, Jr.
“Around America, a Tour of Our Magnificent Coastline,” Walter Cronkite (signed). “The Caine Mutany,” Herman Wouk. “Neruda, Selected Poems,” Pablo Neruda. “Garlic and Sapphires,” Ruth Reichl. “Kafka, a Collection of Critical Essays,” edited by Ronald Gray. “The Man Within My Head,” Pico Iyer. “The Brief and Wonderous Life of Oscar Wao,” Junot Díaz. “The Dude and the Zen Master,” Jeff Bridges and Bernie Glassman. “After the Crash,” Michel Bussi. “The Inferno of Dante,” Dante, translation by Robert Pinsky. “The Royal Nonesuch,” Glasgow Phillips. “At The Same Time, Essays and Speeches,” Susan Sontag. “Heidegger and Modernity,” Luc Ferry and Alain Renaut. “The Teachings of Don Juan: a Yaqui Way of Knowledge,” Carlos Castaneda. “Speaker for the Dead,” Orson Scott Card. “Children of the Mind,” Orson Scott Card. I elected to skip reference books, cruising guides, and the like. Here is that link to Howard Rice’s blog about his epic Cape Horn adventure, The Voyage of Southern Cross, and you can click HERE to hear Mike McDowall’s amazing recent interview with Howard on Boat Radio. Fare thee well, West Palm. There was adventure aplenty as Leg I fades into the books. Never have two men and one badass boat had more fun being arguably miserable a’sea than Chris Pruitt, Ave del Mar, and I did during our 20 hour slog south from West Palm in the near-coastal waters of Mother Ocean. I will only say that it was both a shakedown and a test of substantial magnitude, and I could not have chosen two better companions than them to be by my side. Most of those hours were spent in wonderment of Ave del Mar’s incredible ocean going manners as she chewed up and spit out wall after wall of Atlantic water, while Mr. Pruitt and I accepted our repeated wash downs with a reactive holler, a brief (and insincere) expletive, and then a hearty laugh. It is a rare friend who proves himself so absolutely, and a rare friend in Chris I have indeed. I left West Palm Beach with a bang, not a whimper. In this episode of Postcards From Sea my firstborn Alex joins me to discuss feta cheese, how to do nothing on the boat for a solid week, whether or not she has actually sailed Ave del Mar, and if Türkmenistan is a real country. In my new podcast Postcards from Sea you will be able to hear the stories of my travels, told with a little help from some of the wonderful characters that I meet along the path. Listen right here or enjoy this and many other wonderful boating podcasts by visiting http://www.boatradio.tv. With Marjorie Bryson and Ave del Mar. My phone chirped, and the screen said New Text Message from Elizabeth SV Luna. I slid the screen open with my thumb and looked, but there were no words — just a photo of a brown cardboard box with my name on the front. I had a package awaiting me at my friends’ office. A couple of hours later, after dropping Margot, my dinghy, back into the water, I rowed in and walked the few busy West Palm Beach blocks to a tall, white office building. In shorts and a t-shirt, with my flip-flops flip-flopping and a red bandana tied around my crazy hair, I made my way across the mirror-clean tile floor of the building’s main foyer and sprung up the stairs to the second floor, two at a time as always. I poked my head in the office door where my friend Chris sat hard at work on his computer. He motioned me in. “Just picking up a package,” I said somewhat nonchalantly, such that if he were deeply focused he could wave and I would be gone. He stood, though, and we chatted for a few minutes about those things that cruisers chat about: pretty new boats in the anchorage, drama on the docks with boats that have been sold and re-sold and never seem to shake the tragedy of their own energy, comings, goings, and pleasantries. I knew that my friend was busy, so a few minutes in I stuffed the delivery box into my backpack and offered my farewell. The package was from Ave del Mar’s previous owner Marjorie Bryson, the wife half of the husband-and-wife team of Jamie and Marje Bryson, and indeed it contained a portion of Jamie’s ashes. He had died in early August of 2016 after a years-long battle with Parkinson’s disease that left him in constantly-declining health but with a spirit that remained as big as the Alaskan skies he used to fly in his small plane. His ashes had been divided into thirds, with one lot sent to rejoin him with his Alaskan home, one lot sent to rejoin him with his first wife (who had died many years ago when a plane they were flying went down into the Gulf of Alaska), and a third lot sent to my care, so that Jamie could have one last voyage aboard his beloved sailboat Ave del Mar, this time with me at the helm. I think Jamie would be proud of me at the helm, even if he might scoff at a few of my “improvements” to “his” boat. I think he would rib me about my obsession with LED light fixtures and feign disgust that the top stripe on the hull has been changed from blue to marine green. He would grumble about his cassette tape collection being discarded or that I store food in bins on what was a paperback bookshelf for him. But he wouldn’t actually care, and I wouldn’t bother to defend myself to him anyway. We would stand there, face to face, old regime and new regime in a courtship of mutual respect. Jamie sailed Ave a lot. I’ve told those stories many times over. Together they circumnavigated the world with Marje and their son Stewart over five years, passing through both the Suez and Panama Canals. Years later, thirsty for more, Jamie set out singlehanded, conquering the gold standard of sailing: the rounding of Cape Horn on South America’s southern tip. Jamie and Ave del Mar both have pedigree. They have chops. I have dreams. I can’t even see chops from where I sit. But Jamie was a fan. We stayed in regular touch over the years, Marje handing the phone off to him when I called and Jamie’s voice sparkling to life through the speaker. There were a few busy stretches when we may have missed a week or two, but in general it stayed consistent right to the end. Marje and I offered faint debate as to who among us benefitted more from the calls. We never did settle that. I still think it was me. She thought it was her, because Jamie always perked up dramatically when I called. Whether or not Jamie thought it was him we will never know. These sorts of questions were usually straight-man setup lines. You weren’t really supposed to guess. “Tell me,” I offered. We never met face to face, Jamie and I, but I cried long and hard and deep when I got that phone call back in August letting me know that the end was upon him. I have painted his boat and fixed her engine. I’ve re-rigged her and re-wired her and sailed her from Annapolis to Florida and again within Florida as much as I could. She is as ready as I can get her and I am as ready as I can be. Soon Jamie and I will finally sail together — him for the last time as I take him to sea, and me for what I hope is the first of many crossings. I can see him scowling at changes made to his beloved Ave, but I can see that sparkle in his eyes, too, and the hint of a smile on his lips. He really is ok with it all, in the end. Mike McDowall, Boat Radio’s founder and gifted host, lives on the idyllic island of Mallorca and has a truly-fascinating backstory. He has agreed to be a guest columnist here on avedelmar.com. I trust you will enjoy his tale as much as I did. On the first evening in our new home on the island of Mallorca, I gazed out of the bedroom window at the Mediterranean Sea and at the mountains lit pink by the setting sun and I thought how wonderful it all was. I then looked into a nearby garden and watched open-mouthed as one of my neighbours – an overweight, bandy-legged and particularly hirsute man in late middle age – took a shower under a hose clipped to a washing line. Mercifully he wore a pair of underpants, although they were sodden and sagging and water piddled from the swollen pouch in a constant stream. I called my wife and we watched, mesmerised, as he shampooed his entire body, getting both hands down those underpants. Somewhere a donkey brayed hysterically. My wife and I moved to Mallorca from London just over a year ago in search of a better life for our daughter, Molly. Island life has always appealed to me although even now, after dreaming of it for years, and after living it since last summer, I cannot quite put my finger on why. What I can say for sure is that there are a great many positive aspects to living on this island. 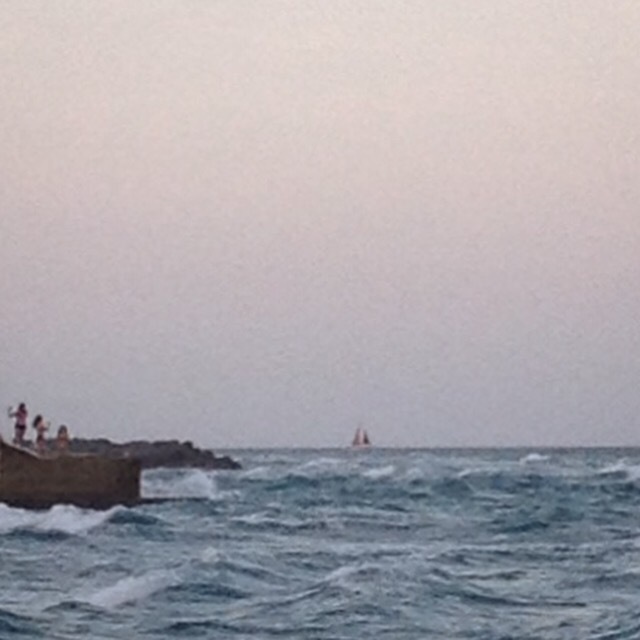 And, of course, one of those is the multitude of boats. I love boats. I love them as a means of transport but also as objects of sometimes ethereal beauty. I love them too because it is possible, in a relatively small vessel, and without an engine, to circumnavigate the globe in some comfort and at very little cost. I find this reassuring and also remarkable almost to the point of miraculousness. I have sat for many hours in dockside bars in Piraeus, southwest of Athens – the busiest passenger port in the Mediterranean, actually in the whole of Europe – and watched boats of all types and sizes arrive and depart. I’ve done the same thing in London, New York, Amsterdam, Barcelona, Sydney, Hong Kong, Genova, Monaco, Eivissa, Palma de Mallorca and numerous other places around the world. I can while away entire days watching boats. As I write this, thunder is reverberating around the Sóller valley. The rain is absolutely torrential and a remarkably large, vivid green praying mantis has sidled in through the open window looking for shelter. After another long, dry summer, this weather is welcome. Meanwhile in Florida, John Herlig, skipper of this blog, has been forced ashore and is doubtless anxious as Hurricane Matthew threatens to destroy Ave del Mar and, with her, years of passionate toil and craftsmanship. I have renovated a couple of old houses but that’s mostly donkey work: gruelling but not particularly skilled. Restoring an old boat, on the other hand, is more like breathing life into a piece of antique furniture. It requires expertise, dedication and, above all, patience. Plus, when your house renovation is completed, you’re not then required to float the finished project in a churning, swirling, splashing body of corrosive liquid. Boat restoration requires a level of forbearance I’ve never had to find. One day, perhaps in my home harbour, Port de Sóller, I hope to join John on board Ave del Mar and crack open a bottle or two of the excellent local cava Mallorquín. And I will record that momentous occasion, in both sound and vision, for myself and also for Boat Radio. So I’m a little tense as Matthew approaches Florida; concerned primarily for the people in its path but also for Ave del Mar. But it wasn’t boats I was dreaming about as I gazed out of the bedroom window on that first night, it was Boat Radio. I have worked in media for more than twenty years. I started out on hospital radio in Bristol, reading aloud from the newspapers and spinning a few tunes. My core audience consisted of those receiving treatment on a long-term basis – mostly the elderly and the dying. Back then old ladies were still very fond of Frank Sinatra so I received many requests for ‘My Way’. Unfortunately, the opening line – ‘And now the end is near and so I face the final curtain’ – was deemed inappropriate for those in palliative care so it was on our list of banned songs. So were ‘Girlfriend in a Coma’ by The Smiths and ‘Drop Down Dead’ by The Housemartins. I’m pretty sure I didn’t ever play anything by The Grateful Dead and even Joe Jackson’s humorous ‘Cancer’ was forbidden. Looking back, I realise I should have subverted those nonsensical rules. I should have played Amii Stewart’s ‘Knock on Wood’ and dedicated it to ‘those planning a casket send-off’; ‘Disco Inferno’ for those headed for the crematorium. After college, I took a job as a newsreader on a local network called Chiltern Radio, based just north of London. Within eighteen months, I’d moved to LBC – London’s best-loved but doomed talk station. Since then, despite my being a dyed-in-the-wool slacker, I have presented and produced some of the most popular and acclaimed news and current affairs shows in the UK, working for the BBC, CNN, AP, ITN and various other acronyms and abbreviations. Oh, and Reuters. These days, I ignore all of them. Boat Radio began as an idea for a weekly show on a local station. But Radio One Mallorca was not the place for what I had in mind and I could drum up no interest at all among other media outlets so, in the end, the only option was to start my own radio station. Or so I thought. 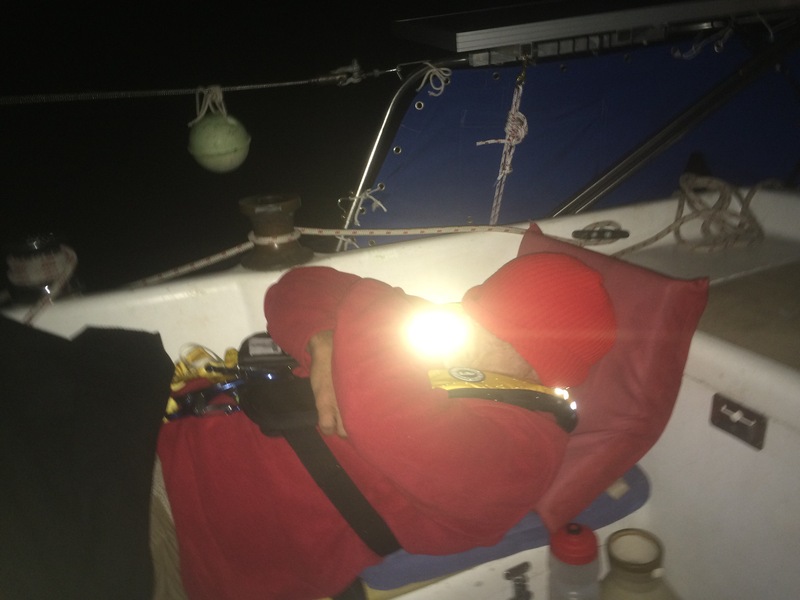 Boat Radio burst into life on July 1st, about an hour later than advertised and about two weeks after the birth of my second daughter, Martha. The first manifestation was as an audio stream. Visitors to the Boat Radio website immediately heard the day’s programmes as though they’d switched on a wireless set. I sat in my garden, sweating buckets in the scorching summer heat, editing and uploading radio programmes with maniacal fervour. Alongside me sat the mighty James Finlayson – another former BBC radio man, who came to stay in the casita at the end of our garden and who was pivotal to the launch of Boat Radio. Even before lift-off, we were plagued with technical problems. If the audio streaming service was interrupted for a software update, which it was, frequently, the schedule would suddenly and irremediably fall out of kilter and it would take me hours to rewrite it. Add to that the pressure of feeding the voraciously hungry beast that is talk radio and things soon started to unravel. Even with James working away for 12 or 15 hours at a time at the other end of our garden table, and dedicated presenters and producers delivering fresh reports from all over the world, I was unable to keep up with the sheer quantity of material required. Help came from an unexpected quarter – the listeners. They rode to the rescue by making it abundantly clear that what they wanted was not radio in the traditional, scheduled sense. Instead they wanted a library of shows available to stream or download whenever they felt the inclination. And so the current manifestation of Boat Radio emerged. I use the word ‘current,’ but in fact it changes all the time. Soon we’ll start adding video to the website: interviews, documentaries, vlogs and other material of interest to our listeners. We will also be covering some live events, including Sarah O’Kelly’s upcoming shark dive. There will be feature articles and photo essays too, and I hope to revive the original plan to have a decent weather programme. I hope also to begin a series about boats and sailors in popular culture, fictional or otherwise. Michael John made a terrific show about Joseph Conrad’s yacht, The Nellie. I would like to hear similar programmes about the African Queen, The Bounty, Alexander Selkirk, Donald Crowhurst, Thor Heyerdahl, F/V Andrea Gail, and many more. Plus, Zaca, of course – Errol Flynn’s old schooner, which was berthed here in Mallorca for many years and which later rotted for three decades before undergoing a complete restoration. Yes, Boat Radio must somehow find a way to get on board Zaca. James Finlayson will soon be launching a show about inland waterways – Slow Boat, will look at the UK’s magnificent canal and river network and the many different types of vessel which plough those waters. Sailing royalty Lin Pardey will be joining us with regular programmes from her home in New Zealand. We’ll be podcasting some of the very best interviews from Andy Schell, who many of you will know as the face and voice of 59° North. Plus, Dan Mattson of Hooked on Wooden Boats will be providing us some of his excellent material, recorded in the Pacific Northwest. Boat Radio isn’t about boats, it’s about the people who sail or drive them; the people who live and work on them. It’s about great yarns and inspiring life stories. It’s a labour of love but it’s also a real contender in the world of podcasting. Our programmes – 145 of them to date – have already been streamed or downloaded 50,000 times. Last week, 1,000 people per day listened to our programmes. This week, I expect that number to be around 1,100. It’s clear there is a demand. Pretty soon there’ll be commercials but we’ll keep them as unobtrusive as possible, preferring to opt for programme sponsorship rather than ad breaks. And I plan to use Boat Radio’s growing popularity to promote good causes like our chosen charity StreetInvest.org I hope as well to persuade John Herlig to document his voyages aboard Ave del Mar – irregular postcards from an irregular life, if you will. Please take a look at the website – www.boatradio.tv – and let me know what you think of it all. If there’s anything you think we’re missing, let me know. We may already have a solution in the pipeline, we may not. Either way, it would be great to hear from you. Incidentally, our neighbour, who works in a bank, has not indulged in any more al fresco bathing. Well, none that I’ve witnessed. That first night must have been a special occasion. PS. I know, I know – Eddie Floyd’s original ‘Knock on Wood’, on the Stax label, is doubtless much preferred by aficionados, but I was a disco-era kid. I have a copy of Don Quixote that is dog eared and yellowed throughout its 1023 pages. There are no fewer than 4 bookmarks in it—one is of the proper glossy cardstock variety that says “BOOKS for every age and INTEREST, The Book Exchange, N. Palm Beach,” and another three that are either receipts or scraps of paper conscripted, perhaps, for marking an important passage worthy of later debate or contemplation. “Do you read? You look like a reader.” This came to me from a calm yet teary-eyed woman named Tiffany who was standing on the West Palm Beach city docks next to Ave del Mar. I had just introduced myself, not really sure why there were so many people coming and going from the somewhat disheveled looking sailing vessel Capricious that was docked right in front of me in the Florida sunshine. I came to learn that Capricious had belonged to Tiffany’s father, Richard, who had died just a few days prior from a particularly nasty skin cancer that he may-or-may-not have attended to as diligently as was required. “He has so many books,” she went on. “I would love it if you would look through them and see if you’d be interested in any.” I stepped onto the decks of Capricious and into the cockpit where I saw the line of books running along the seat. Most were crime novels of the sort that I don’t often read, but there at the end was Cervantes’ Don Quixote, thick and worn. I clutched it, long enamored with the stories of the great hidalgo Don Quixote de la Mancha but not ever having owned a copy of my own. Over the next few days Tiffany told me stories of her father. She told me of working with him in his restaurant and of his dreams and disasters. Richard and his boat had run aground several times there in West Palm as his health deteriorated—stories confirmed by a gloriously-dreadlocked man named Benjamin who added tales of the vessel bashing into coral reefs in the Bahamas and the gallant Richard soldiering on, consequences be damned. Chaos covered the boat like a fog. A bicycle leaning on the port lifeline was more rust than metal, and one could only wonder if it was the lifeline supporting the bike or the decaying bike propping up the lifeline. A thick coat of soot from engine exhaust covered the transom and items of questionable condition littered every inch of the decks. It seems the boat, like its now-former owner, was a bit of a lovable wreck. “He was always ‘almost ready,'” Tiffany said, looking down at her feet, “always ‘about to go’ or ‘this close’ to going, but the islands are as far as he ever went. He was a dreamer.” I stood there, knee-deep in my own dream, consoling a woman I hardly knew while clamping one of her just-dead father’s books under my arm. I think lots of sailors are dreamers, books of fantasy and chivalry tinting our minds and our perspectives. “Didn’t I tell you to be careful? Didn’t I tell you they were only windmills?” Sancho Panza scolds Don Quixote in the book. No matter the circumstance, no matter how clearly things looked to be one such way from the outside, our hero sees his reality through very different and unwavering eyes. I often wonder if the Don Quixotes of the world are crazy at all. Being eternally true to oneself is hardly a crime, whether your trusty steed is a horse or a boat. I wish I had met Richard. I wish I could tell him that his book is in good hands and that knight errantry lives on in the hopes and dreams of sailors everywhere.